The Corbeau Moab seat is the seat Jeepers have been waiting for. 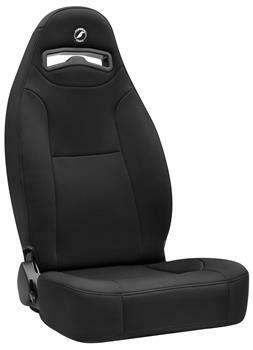 Designed with a tubular steel frame and high density injection molded foam, giving you ultimate comfort and safety. Other features include an adjustable back, enhanced bolstering to hold you in place, harness slots providing 3,4, or 5 point harness capability, and an elasticized mesh map pocket. The Moab is available in Jeep color-matched vinyl, vinyl/cloth combo, or waterproof neoprene. In addition, the Moab is a direct bolt in to all CJ and YJ Jeeps, that means no brackets required! The Moab will fit in any other vehicle with custom Corbeau brackets. The Moab will fit up to a 42 inch waist.